Hospital Direct Medical Equipment Inc. is a wholesale and retail medical equipment company that sells hospital equipment, supplies and medical equipment to hospitals, surgery centers, home care and also a lot of film production, TV productions and theater groups around the USA. San Diego, CA, April 12, 2019 --(PR.com)-- When it comes to buying props and medical equipment for a set design there are not a lot of choices in the USA however one wholesale medical equipment company based in California and Virginia is helping West Coast and East coast TV, film, video and theater production companies get much needed medical equipment used in hospitals for various sets and productions. Hospital Direct Medical Equipment Inc. is a medical equipment company that sells and rents a large amount of medical hospital equipment wholesale to TV and film production companies in Los Angeles, Vancouver Canada from their San Diego California location and for New York, Boston, Atlanta and Richmond from their Richmond Virginia location. As part of the iMedical Equipment and Service brand they are also able to provide movie set locations from their Richmond Va. showroom which has been used for numerous medical room backgrounds for TV shows, commercials and product promotions. Hospital Direct Medical Equipment is able to provide full staging of hospital patient rooms, operating rooms, doctor offices, medical hallways and other parts of a hospital, doctor office, imaging room, urgent care, ER and more. As a company that already sets up these places professionally having medical equipment for sound stages or film production is easy. 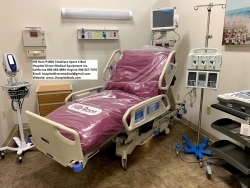 Basic items like patient room furniture, stainless steel, medical cabinets and hospital beds are very popular and can be shipped anywhere in the USA or Canada. For TV and film production crews looking for medical equipment props and hospital equipment contact the company below or visit the following websites for more information. Hospital Direct Medical Equipment Inc. is a full service medical equipment and hospital equipment props provider for motion picture sets, film sets, TV production and theater sets all over the United States and Canada.